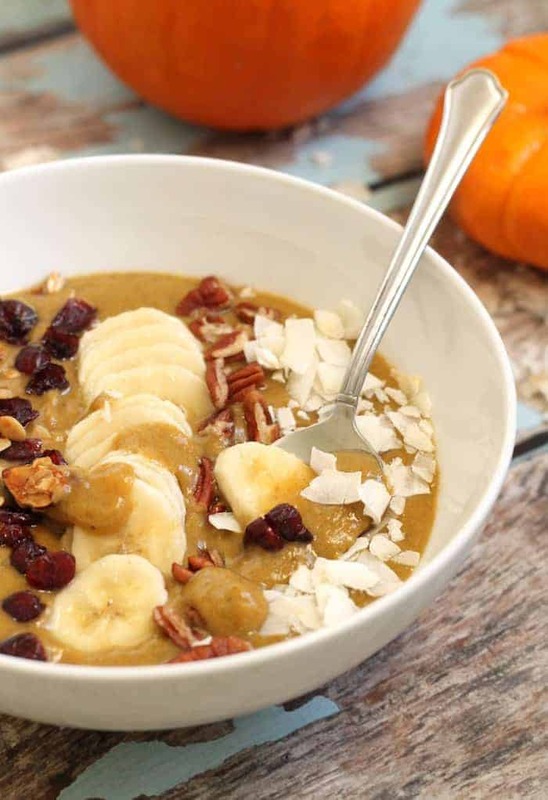 Your favorite pumpkin pie flavors in a healthy, thick, and creamy smoothie bowl! There are some food-related things that you will likely never hear me say. Let’s get back to the first one. The temperature is slowly but surely starting to drop. We’re trading in our flowy-flowery-fun summer dresses for cozy flannels, ripped jeans, and brown booties. Can you tell I have shopping on the brain? 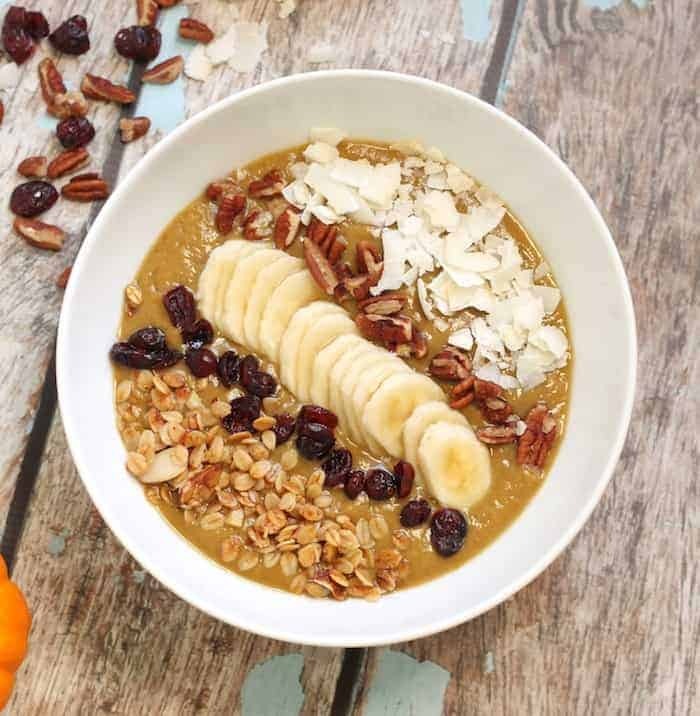 We’re leaving our smoothies in the dust and giving a warm welcome to the glory that is oatmeal. We’re brunching on eggs and toast and pancakes and hot things that warm us from the inside out. Smoothies are summer food. Right? Ehh. This girl says otherwise. I’m never not in the mood for a smoothie. They’re like liquid courage. My body associates waking up with a smoothie. Brush teeth, wash face, put contacts in, get dressed, make smoothie. We can still be seasonal here! Scoot on over pineapple. Ever heard of an apple smoothie? I know you’re all about the Pumpkin Pie Smoothie. 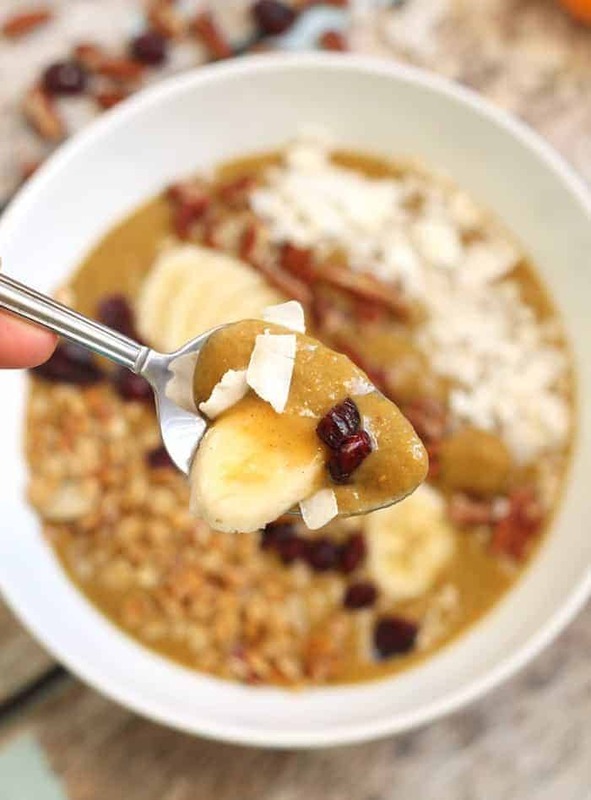 Now let’s thicken ‘er up and call it a smoothie bowl! Because smoothies taste best when thickened and eaten with a spoon. 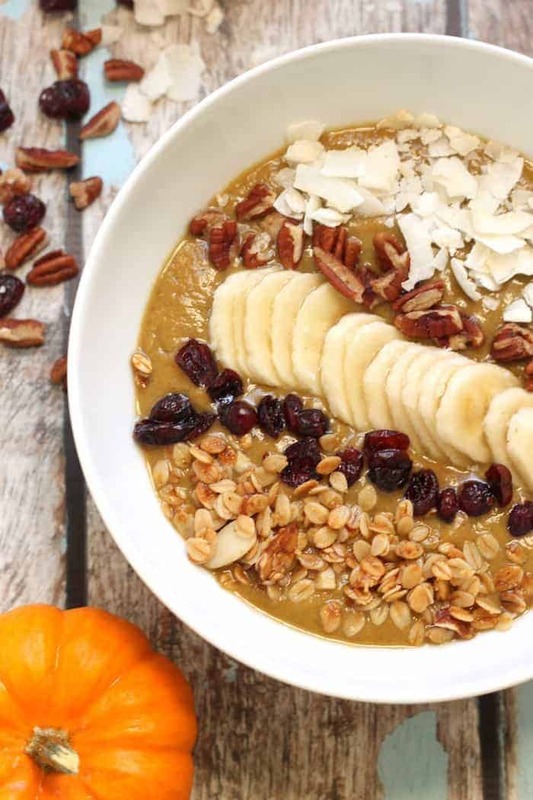 Looking for the magical smoothie bowl formula? Less milk. A bit more frozen fruit. We’re all shocked right now. Don’t forget the superfood toppings galore. Consider the smoothie the “mylk” to the “cereal” toppings. That’s my kind of cereal! My go-to toppings are cacao nibs, puffed quinoa, or Love-Grown Power O’s. Try fruit, granola, nuts, coconut, or anything else edible that suits your fancy. And yes, you can most definitely add spinach to your smoothie bowl. Can I just say that I think this would be BEYONDDDD with a crumbled Pumpkin Bar on top? Oh my god. Yum! I have been waiting for the recipe since I saw it on your Instagram :) can’t wait to try it out this weekend! I like your fall twist on this one! It looks awesome! The pumpkin smooooothie booooowl! GAH you genius! I definitely drink smoothies no matter the outdoor temp, too…they’re just so satisfying! I need this bowl with all the toppings in my life. Pretty sure you told me yesterday it was so cold for smoothies…or was it that you’re too pretty for pumpkin? Yes!! I’m pretty sure I’d like this even better than a regular pumpkin pie smoothie. Will be made for breaky this week!! I feel the same way about ice cream, I can eat it year round! But I also enjoy smoothies year round too. I definitely need to add this one to the list. I don’t think you’ll ever hear me say “Anyone want the rest of my food?” or “I forgot to eat.” Never. Smoothies with a spoon > smoothies with a straw! And there is no such thing as non smoothie season. Heyyyy there!! No pumpkin?! Say it isn’t so! I was jusssst heading into the cyber world for some pumpkin smoothie inspiration, and bam, here you are. I definitely don’t gravitate towards smoothies once the weather cools down, but if its pumpkin pie.. I’ll just grab a blanket. Thanks! I’ll never ditch my smoothies due to cold weather – and this one looks absolutely delicious! I’ve been all about eggs recently for breakfast, but seeing all of these pumpkin smoothie recipes makes me want to whip out my blender again!! I’ve never actually tried making a smoothie with pumpkin, which sounds like blasphemy! “Because smoothies taste best when thickened and eaten with a spoon.” <– AMEN! But I may be slightly biased ;) And I drink smoothies in the middle of winter while sitting by the fireplace with a hoodie on. No shame. Can you cook Smth with an actual pumpkin not pumpkin puree or canned pumpkin. The real stuff! Can I cook this for example with the real one?